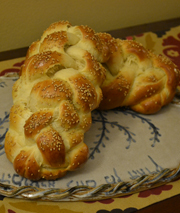 This recipe is a modification of my Basic Challah Recipe #1. It contains 2 additional tablespoons of honey because I find that whole wheat isn't my favorite thing and can end up kind of cardboardy. The verdict on this recipe... I'm still not totally convinced. The Hazz really likes it, and I did munch on it this Shabbat morning with some added Nutella on top (I'm convinced Nutella makes everything better). Don't skip out on the wheat gluten/wheat germ. I think it makes a big difference and it contains lots of protein! 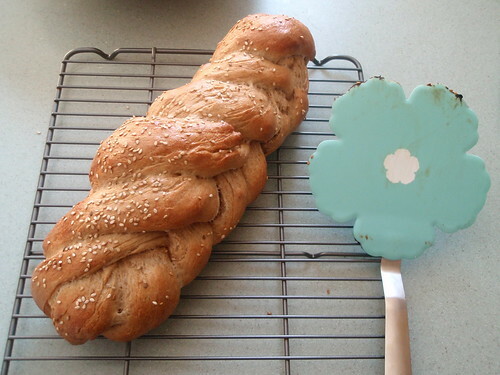 Follow the recipe for the Basic Challah Recipe #1. I added the extra 2 tablespoons of honey with the eggs, but I don't think it really matters all that much. 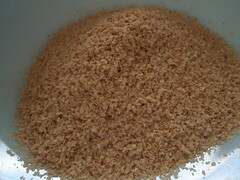 Make sure to mix the flours and salt together dry otherwise you'll end of up with clumps. 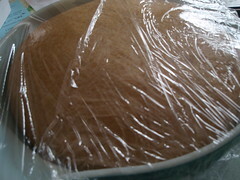 Bake at 350 for 35-45 minutes. I found this rose SLOWER than white flour for some reason, but it could have been the house temperature. The Hazz is a lot stronger than me for punching out the air. 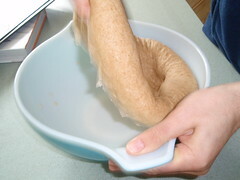 The second Challah we made this week was Cinnamon Wheat. 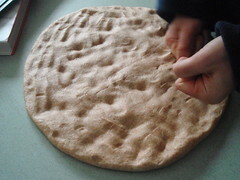 (same dough). Method can be found here!